First time home buyers fret over getting a mortgage loan. The loan mortgage process is full of jargon, and a first time home buyer may find it overwhelming to process all the information on procedures. Finding a competent Calgary mortgage broker is somewhat like picking out a needle in the haystack; your broker will have only to show you how to thread through the technical fabric of the business. Over the years past, people have witnessed and taken note of the pitfalls of the mortgage industry. 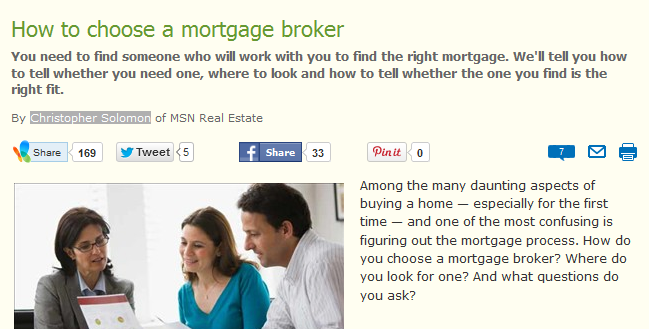 There are banks who have also taken over the role of mortgage brokers. It may seem convenient to settle for banks as it minimizes the hassles of having other people to deal with, or of having to scout around for a potential broker, but there’s no denying that brokers are far more knowledgeable in their game; it is their job and expertise to simplify home loan for you. Reliable companies specializing in Calgary mortgages should be able to provide you with a comprehensive list of lenders, with consideration on the affordability of rates. A limited list of two or three options does not reflect comprehensiveness and in this, your broker isn’t servicing you properly at all. Relying on referrals does not always guarantee solid credibility as colleagues may only be doing each other a favor. A word of caution from the experts: established mortgage companies don’t engage in solicitations, they let their names do the talking. Home buyers should avoid the mistake of falling for that trap. Professional mortgage brokers, such as the experts from Ultimate Mortgage Partners are more than eager to simplify for you the arduous task of buying a home.